New Balance Fresh Foam 1080 v7 are neutral cushioned running shoes. The New Balance Fresh Foam 1080 v7 is the second edition of the premium running shoe from the american brand featuring Fresh Foam which is more and more common among cushioned shoes designed in Boston. 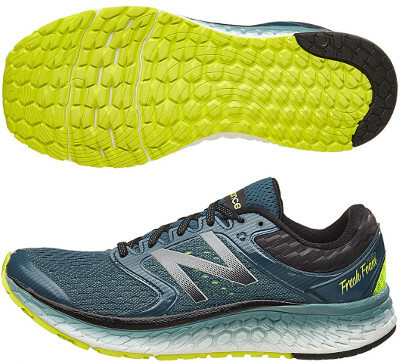 Previous release (1080 v6) was an absolute disruption of what neutral runners were used to wear and current one (1080 v7) tries to amend what was not working great (like smoother transition) in order to provide an exceptional running experience with abundant cushioning and superior comfort although at high price tag. Removable insoles can be replaced with custom orthotics if needed. Upper has been upgraded from its predecessor Fresh Foam 1080 v6 with engineered mesh which not only adapts better but is also more open for improved breathability. Interior follows bootie construction trend with tongue attached to both sides for enhanced comfort. Heel counter is a little bit stiffer for increased stability and also pad is bigger in order to better protect achilles area. Although there is no name change regarding Fresh Foam, there is an evolution of the technology with different geometry depending of the position for plush cushioning and smoother transition. Outsole is very similar to last release with modified lug pattern in the forefoot and more transversal grooves including several spaces for more flexibility to support a quicker toe-off.